The strange tale of Knee Deep doesn’t spawn from a vacuum. 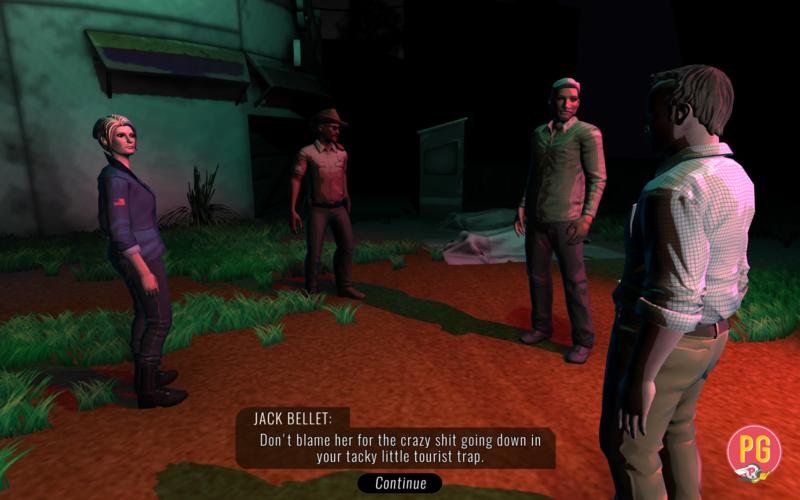 It’s drawn inspiration from theatrical performances, music, movies, books, and also the memories of the swamp noir adventure’s lead writer/designer, Wes Platt. Jack Bellet got his last name from former Tampa Tribune photographer Fred Bellet. Romana Teague’s first name is an homage to Roman Polanski, director of Chinatown, a favorite noir film. K.C. Gaddis got his last name from Carter Gaddis, a writer who also attended Wes Platt’s alma mater, the University of South Florida. Rich the Swamp Yeti (Plush Sasquatch) is an homage to Red Storm writer and novelist Richard Dansky, whose quest for Bigfoot marches on. Mostly Maule’s Lilac-Scented Hand Lotion got its name from Allan Maule, playwright behind a show called Everscape and another former Fallen Earth developer. Hammock’s Sanitary Handi-Wipes got their name from lead Fallen Earth developer Lee Hammock. Shovelhead was a real pit bull during Wes Platt’s early days as a journalist with the St. Petersburg Times. Pasco County deputies shot and killed the dog during a drug raid, before seizing a refrigerator full of marijuana. Red Eclipse Studios got its name from a player-run mercenary organization on OtherSpace, an online sci-fi storytelling game that’s been evolving since 1998. Wilber’s Waggin’ Doggie Treats, Monroe’s favorite snack, got their name from writer and former USF Oracle newspaper adviser Rick Wilber. Red Eclipse director Donovan Miller got his last name from former USF journalism professor Randy Miller, who taught Wes the critical differences between “more than” and “over,” as well as the fluidity of details in breaking news events. The “Opto Test” that Romana Teague and Jack Bellet can take during Act 1 is a cross between Scientology’s Thetan meter and Blade Runner’s Voight-Kampff test. One of the test questions is blatantly inspired by Blade Runner when it refers to a lost smartphone on its back in the desert, screen baking in the sun. Morgue workers Carl Rosen and Gil Stern are inspired by Shakespeare’s Rosencrantz and Gildenstern in Hamlet. Monroe was the first name Wes’s mom suggested for his late, great dog – a retriever/Pyrenees mix named Huckleberry. Newspaper editor Ross Stevens is a combination homage to former St. Petersburg Times colleagues Jim Ross and Bill Stevens. WCKN-AM radio disc jockey Billy Ray Gronberg is an homage to Ray Gronberg, a reporter at the Herald-Sun newspaper in Durham, NC. Larry Lammers, an exotic shark thief mentioned in Knee Deep DLC, got his name from no-hitter expert and USF alum Dirk Lammers. The Silloway brothers, Rutledge and Doyle, got their last name from Rocket League developer Thomas Silloway. He used to work on Fallen Earth with Wes and other Knee Deep devs. Dee Dee Lynn Moscardini, caught stealing sweaters in a Cypress Knee arrest report, is an homage to former St. Petersburg Times editor Mike Moscardini and his fondness for cardigans. ANONYMAUS isn’t a typo. “Maus” is German for “mouse,” and Wes worked for several years at Walt Disney World’s Magic Kingdom in his youth. The Aunt Mom and Uncle Dad story is a true Florida tale (more or less), with names changed to protect the guilty. It happened in Pasco County. Irish “Travellers” settling in Cypress Knee is a nod to the faction of merchants, thieves, and assassins that Wes managed during the development of Fallen Earth. Ozzie Clendening got his last name from the late Keith Clendening, a former colleague at the St. Petersburg Times.